Another Pre-season Saturday, another scorching hot summer’s day. It would be rude not to take in a game on such a fine day. And that is why I find myself watching the Garden of England rush by my window, travelling at speeds that would normally make South Eastern trains have a nosebleed. There’s been many a column inch written in recent times about new train lines in this country since the HS2 train line route was announced last year that will cut through the English countryside to deliver travel time savings to us all, at a ridiculous expense. Whilst we can marvel at currently being able to travel from London to Manchester in just 2 hours, the cost of travel still far outweighs the advantages (and it is still cheaper and quicker to fly). But few actually know where or what HS1 is? It has actually been around for well over a year and runs from London St Pancras, via Stratford International, Ebbsfleet International, Ashford International and Folkestone (no International status has been bestowed on the station yet due to a work permit issue). Travel times are, quite frankly ridiculous. 19 minutes from Ebbsfleet to Ashford – less than half of the time it would take to drive there, but the cost is significant. £25 for a single ticket, to be precise, making it more expensive than the very expensive Arlanda Express in Stockholm. And that is where I am currently sitting, in air conditioned luxury. I had packed my bag to head to Folkestone for the day to experience some Kentish hospitality and of course game number six in my pre-season preparations.Travelling by train to football seems so foreign to me but on a day when the sun was shining and the Shepherd Neame was calling, it seemed the most logical choice. If you are going to travel, then travel in style. You can’t go far around the edge of the Kent coast before you bump into a football club, meaning that local derbies are ten a penny in these parts. Stretching from Whitstable Town in the north, through Herne Bay, passed Margate and Ramsgate, waving hello to Deal Town before you reach Dover Athletic, Folkestone Invicta and finally Hythe Town. Whilst passions never run too high in these parts, some games do generate significant local interest. In fact the Folkestone v Hythe local derbies have generated some of the biggest crowds in the Isthmian League in the past two seasons and is testament to the fanbase in these parts. 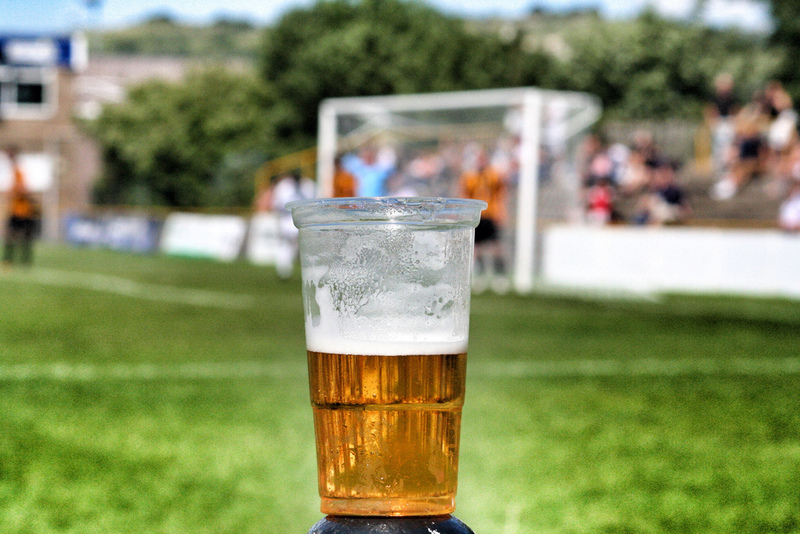 But arguably the biggest game is the Folkestone v Dover tie. 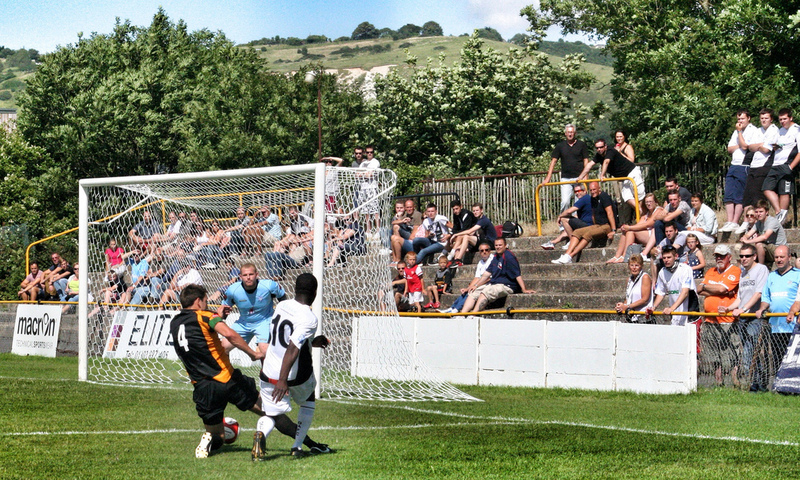 Due to Dover’s recent climb up the leagues, the two clubs rarely meet at a competitive level, and so it is left to the occasional pre-season clash to settle old scores. Two years ago only one division separated the two clubs, as Folkestone Invicta finished runners up to Croydon in the Ryman South, but their ascendency lasted just one season, finding themselves back within twelve months. Last season they reached the playoffs but narrowly lost to the new giants of Kent Football, Maidstone United. So it is with renewed hope that they were preparing for the new season. As one other Ryman South fan mentioned this week, there are no “money bags” teams in the league this season, meaning nobody will be going into next Saturday’s opener as clear favourites. Well, apart from Guernsey. This was my first ever visit to the Fullicks Stadium, previously called the Buzzlines Stadium and properly, Cheriton Road. Every summer during my early teen years I would spend a week down the road with my Grandparents, co-inciding with cricket week in these parts, in a time when county cricket meant more than just money. In those days Kent used to play every year at Dartford and Gravesend as well as Folkestone, Maidstone and Tunbridge Wells. 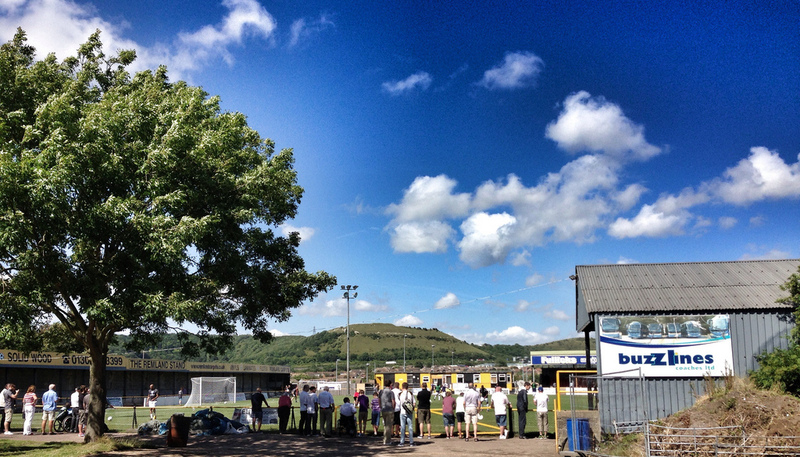 The crowds used to flock to the games such as here at Folkestone, next door to the football ground. So near, yet so far. This was a special game for Folkestone, with all proceeds being donated to a charity close to the club’s heart, in relation to a brain tumour still blighting the life of assistant manager, Mick Dix’s wife. 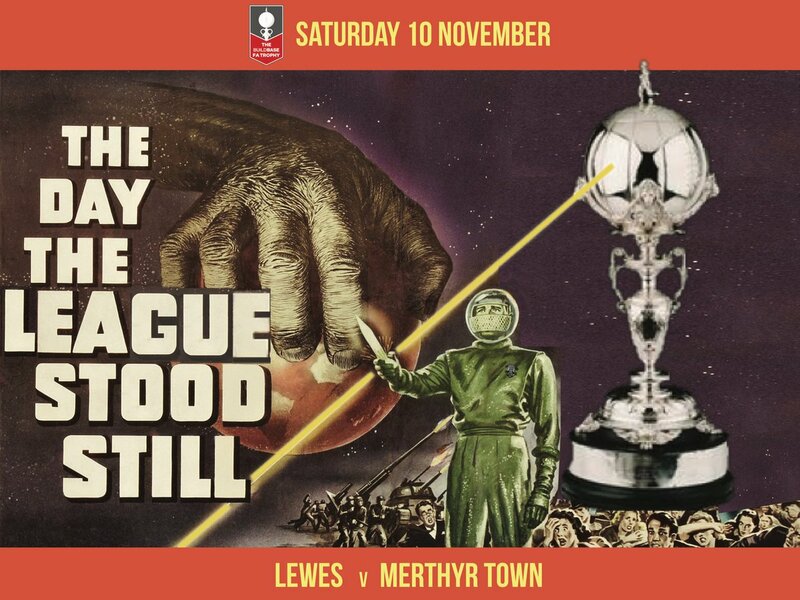 Admission was just £5 (half of the admission being charged by Whitehawk for their derby against Lewes), so the fans hardly needed any more reasons to come along to watch, surely? It wasn’t a classic, to be truthful, but for the 473 fans who saw this evenly matched game, it was an enjoyable afternoon in the sunshine. An early goal from ex-Brentford and Charlton Athletic striker Moses Ademola, finishing off an excellent move, was enough to seal victory for the visitors although they should have scored at least a couple more. For both teams the real action starts in seven days time, where optimism is running high in both camps for a successful season ahead. Dover lined up with ex-Lewes man Tom Murphy on the wing as well as ex-West Ham youngster Terrell Forbes at the back. In the starting side for Invicta was “Kingy”, a man who had left for Maidstone last season for £6,000 and returned a few weeks ago for free. Good business if you can get it. It seemed that Folkestone’s only strategy for long periods was simply to “give it to Kingy”. Not that it made much difference in the first half when Dover should have been out of sight by the time most of the crowd were back in the bar watching the cricket. The second period saw the visitors on the attack from the first kick. Within five minutes Ademola and Murphy had hit the woodwork, the second effort almost resulting in a full pint spillage as I tried to balance my beer on my knee whilst taking a picture. Schoolboy. After the full time whistle with an hour to kill I went in search of a pub. 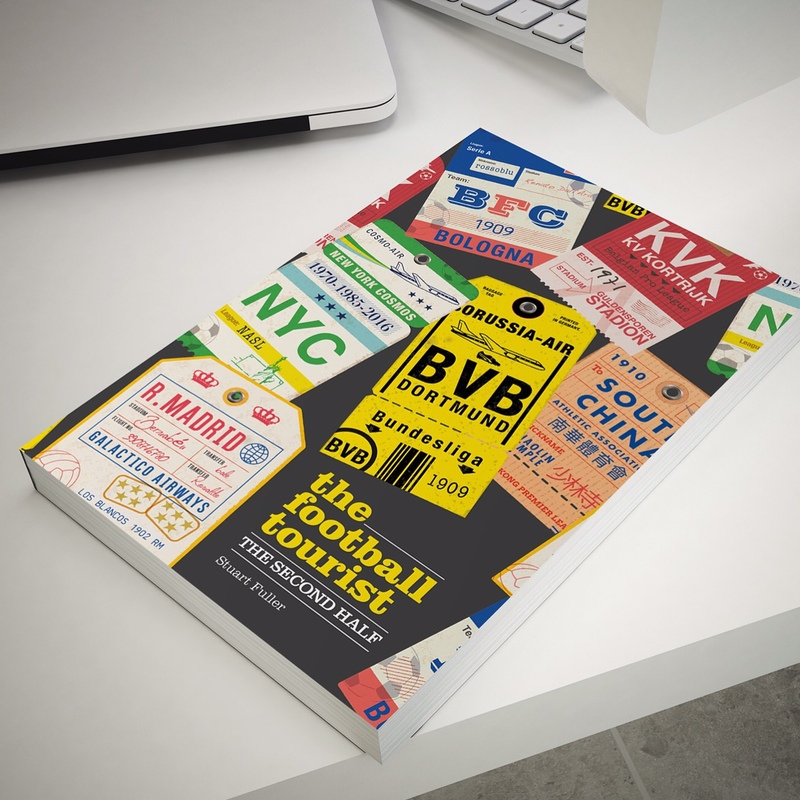 Word of warning for any travelling fans. There are no pubs in or around the ground, and when I mean around I mean within a 20 minute walk, the international standard us blokes adopt for “can’t be arsed to walk that far”. So it was back to the station and the plain old “slow” train back to the metropolis. I came, I saw, I left unconquered or as I remember from my days of Latin “invicta”. This entry was posted in Blue Square South, Non league football, Rymans League and tagged Conference South, dover athletic, Folkestone Invicta, Kent, Ryman League. Bookmark the permalink. There are 3 pubs within ten minutes from the ground in Folkestone. The Royal Cheriton, The Nailbox and The Park Inn, think i have slso missed another as the name escapes me. The clubhouse in the ground, “Stripes” also has a great selection of beers!